Record cold weather in the United States is forcing schools and businesses to close. The “polar vortex,” as it is called, has also canceled flights and suspended mail delivery. The temperature in Fargo, North Dakota, dropped to -35 degrees Celsius. 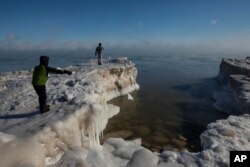 In Chicago, Illinois, it was -28 degrees Celsius, but strong winds made the air feel like -50 degrees. The U.S. National Weather Service warns that a wind chill of -32 degrees Celsius could freeze a person’s skin within 15 minutes. Officials turned city buses into mobile warming shelters to help keep homeless people safe. The cold weather was linked to at least 20 deaths, including a man who froze to death in Wisconsin. It all started with misplaced heat from Morocco, says winter storm expert Judah Cohen. He works for Atmospheric and Environmental Research in Massachusetts. Last month, Cohen explains, the usually cold air some 30 kilometers above the North Pole quickly warmed by about 70 degrees Celsius. The area of air is known as a polar vortex. There is also a polar vortex above the South Pole. The quick temperature change was the result of hot air flowing in from the south. The warmer air split the polar vortex, leaving smaller pieces of it to move around. By Tuesday night, one of those vortex pieces reached the middle of the United States. The unusually cold air could stay around for several weeks. “I think at a minimum, we’re looking at mid-February, possibly through mid-March,” Cohen said. Americans first began hearing the words “polar vortex” five years ago. In early 2014, the temperatures dropped to -27 degrees Celsius in places like Chicago. Weather experts, who had been using the term for many years, began using it on social media. But the National Weather Service says there is nothing new about it. It says the years 1977, 1982, 1985 and 1989 also brought unusually cold temperatures caused by a polar vortex. Last week, the city of Adelaide, Australia reached 46.6 degrees Celsius, the highest temperature ever recorded in a major Australian city. But it was even hotter in nearby Port Augusta, where temperatures reached 49.5 degrees Celsius. Another climate scientist, Zeke Hausfather of Berkeley Earth, said it was important to remember the difference between climate and weather. Hai Do adapted this story for Learning English based on Associated Press and National Weather Service reports. Ashley Thompson was the editor. Quiz - What Is the Polar Vortex?